Could goat keeping in Tenerife still be in hands of Guanches? Goat keeping in control of Guanches in Tenerife? The way goats are kept and handled certainly hasn't changed much since Alonso De Lugo took over the island of the goats from the Guanches. Goat stalls were generally rudimentary set up enclosures, if possible near a cave, as most native people of Tenerife before its conquest, such as herdsmen, slept in Tenerife caves. 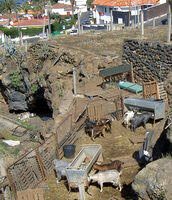 The picture is almost typical for goat keeping, the Guanche way. This make shift open air goat stall is convenient thanks to the climate in Tenerife, about which read up here. In fact, frost doesn't endanger the special Canary Island goats. Contemplate the photo of the stainless steel mangers where the animals are busy feeding. It is in fact unlike Guanche customs of goat herding. What is incredible like so much else on amazing Tenerife Island is the location for goat keeping in this particular case. This enclosure for keeping goats, whose immediate sight is hidden from the road, is right beside a posh suburb of Los Realejos at 13 minutes from Puerto de la Cruz. 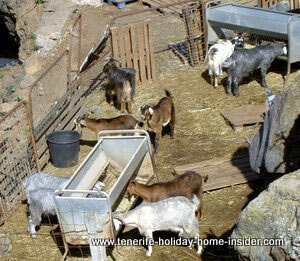 In fact, opposite the road of the goat stall are luxury Tenerife villas. There, many a villa of is rented out in winter as a holiday home in Tenerife Realejos La Romantica 2. Impressive Head profile of black goat Canary Island goat. 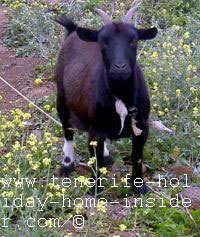 Mind you, it would be nice for the average tourist to see the lovely face of a black goat of Tenerife. Canary Island goats are very different with their floppy big ears. And not to be missed is an even much more spectacular goat picture of a she-goat caught on camera after the goats bathing of Puerto de la Cruz 2011 when the San Juan Fiesta bath was over by 11.30 a.m., unfortunately. I wouldn't have spotted the goats when I walked down that La Romantica road for the first time in 2010. Suddenly, I heard the bleating of an animal and became curious. I walked over towards a big truck. It was parked off on what looked like unoccupied land. Then I discovered the goats below in the barranco gorge. There, they were protected by rocks which formed walls within steep cliff barriers. The rest which enclosed them didn't really look like professional animal fences, as you can see. An eclectic mix of all sorts of barriers kept the goats shut off. Yet, the lucky horned animals wouldn't care. After all, they had food, water and a marvelous view towards the ocean. The goats herdsmen owned the truck. He told me he needed money for spare parts to get his vehicle back onto the road. Perhaps, that's how he used to make more money for a living. At least, he could survive thanks to his mountain goats. It would be interesting to know if he had cheese making equipment there, which he may have stacked away out of the sun. Goat cheese is famous for the Canary Islands, you know... May be the milk processing equipment was hidden in the cave. But I doubt that too, unless he used battery operated stuff for lack of electricity. You may assume that he needed his truck badly. Beside, admire a genuine goat leather bag. Get a close-up of the Guanche leather satchel made of goat skin in one of main museums of the biggest Canary Island in Santa Cruz. 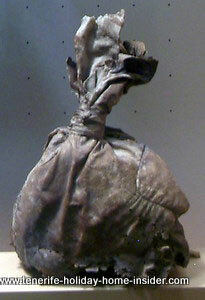 The bag is very old and was discovered with other artfacts in a Guanche cave. The satchel made of goat skin is proof that Guanches had goats already before Spain conquered their island which is now Tenerife. More proof are remnants which were used for clothes many of which were even found on Guanche mummies, the oldest of which were 1000 years old. Religious Guanche cults headed by men or women used to hide with their mountain goats anywhere in high up forests and steep difficult to reach slopes for centuries but, preferable near caves. That was before and after the conquest in 1495. It was carried on for longer than many would have wanted to admit in those days. Why? Most Guanches were almost enslaved like their beasts. Guerrillas also employed the caves for a while and survived with their milk and meat spending mountain climbers. Tenerife has quite big caves for keeping goats and men. However, the neolithic people of Tenerife knew which rock shelters were safe. Today some of the Tenerife caves are health hazards and may endanger human life. Recently, a cave with simple goat gear and other archeological finds as well as skeletons was found in Tenerife south. You shall certainly hear more about it, once excavations are ready to be handled professionally and are off limits for grave diggers. Notice the young she goat... Her owner Cibele lovingly calls her Chiquita (girly). This domesticized goat wears a fairly long necklace with 2 makeshift white ribbons and a bell. She is kept on a 500m long leash to let her roam a field of yummy herbs and flowers, 550m above the sea on an abandoned farm of Barranco Ruiz. Most Canary Island goats in Tenerife are genuine mountain goats, as Guanches used to take their herds high up the slopes, or had to fetch them there. Only nowadays, more and more questions concern Guanches and they don't only deal with surprising Guanche DNA in today?s Tenerife society. Would you suspect that goat keeping is in peril, as mountain goats and all other Canary Islands goats are endangered animals of wildlife of Tenerife? From goat keeping back to wildlife Tenerife in ocean, on land but, except in zoos.